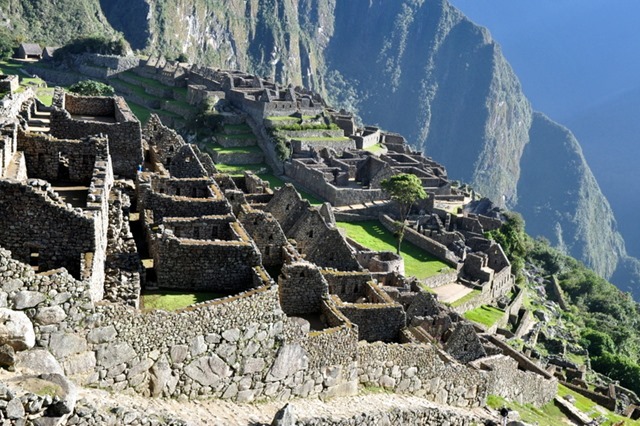 Though stunning in photographs, Machu Picchu takes your breath away in person. By the end of the day, we all said we felt like a broken record because we couldn’t stop commenting on the majesty of the ruins. They truly are incredible. 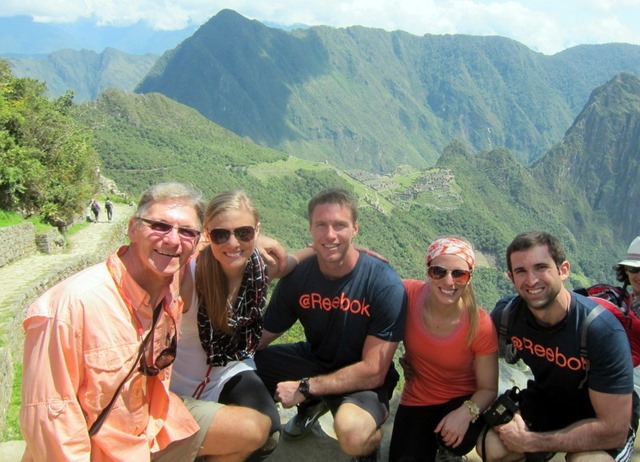 Our day at Machu Picchu began before dawn. We ate breakfast at our hotel before catching one of the first buses up to the ruins. 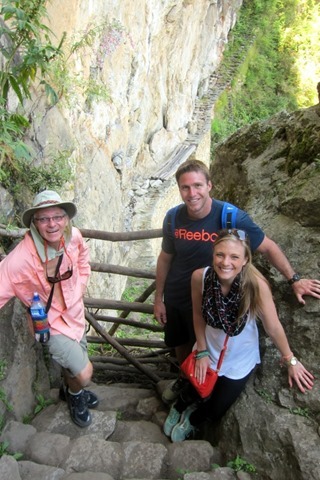 We had a wonderful guide named Victor for our first two and a half hours at the ruins. 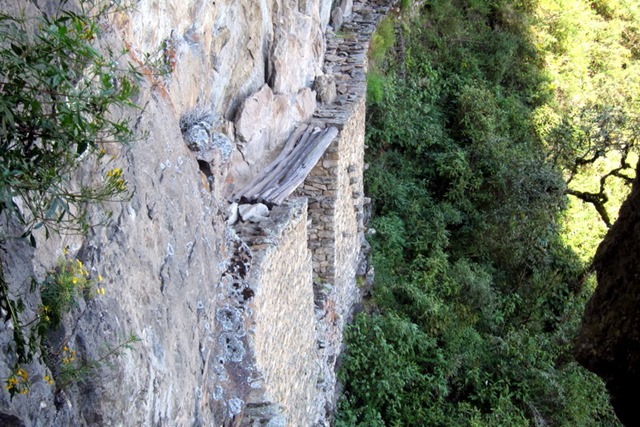 Though our tour was obviously in English, I loved listening to Victor speak Quecha, the language of the Inca, to other guides. 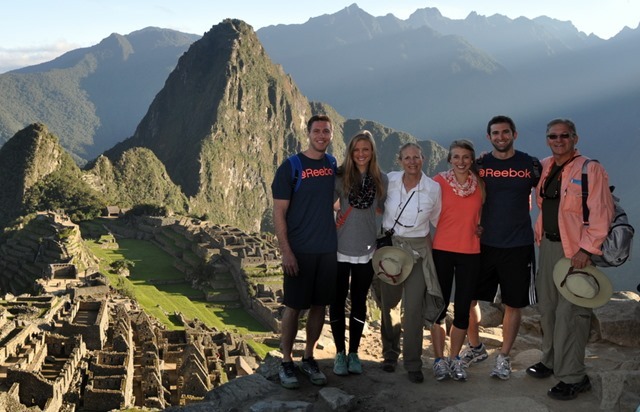 Victor did a fantastic job guiding us around and sharing information with our small group about the incredible place. He began the tour by explaining four popular theories that exist that seek to explain why the city was built. 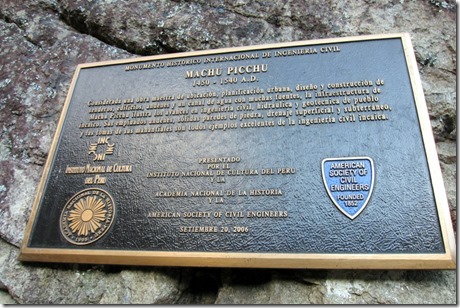 I found the story of the discovery of Machu Picchu interesting as well. 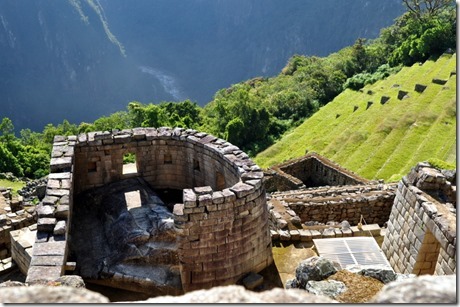 Hiram Bingham, a Yale architect, cleared the site in 1911 after locals led him to the ruins and he understood its importance. Now it is one of the most phenomenal examples of architecture integrating with landscape in the world. If a trip to Machu Picchu is on your travel bucket list, I highly recommend arriving first thing in the morning. We were able to watch the sun rise over the mountains and enjoy the quiet, peaceful energy of the place before it started bustling with tourists. Victor’s tour was extremely informative and, as always, I had a ton of questions. 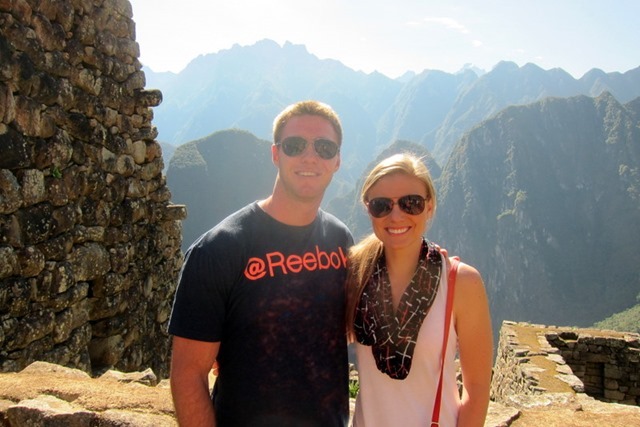 He was able to answer every single one and I loved learning about the history surrounding Machu Picchu. 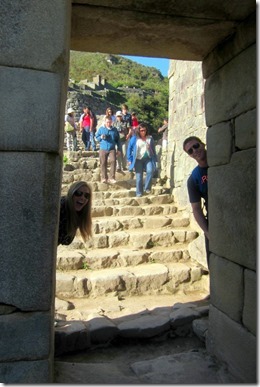 As we walked around the ruins, Victor pointed out important highlights, including the only door that led into the city. The door, known as the Main Gate, was sealed at night to keep invaders and large, dangerous animals out of the city. The Temple of the Sun was one of the most impressive sights at the ruins. The temple was built with only two windows. 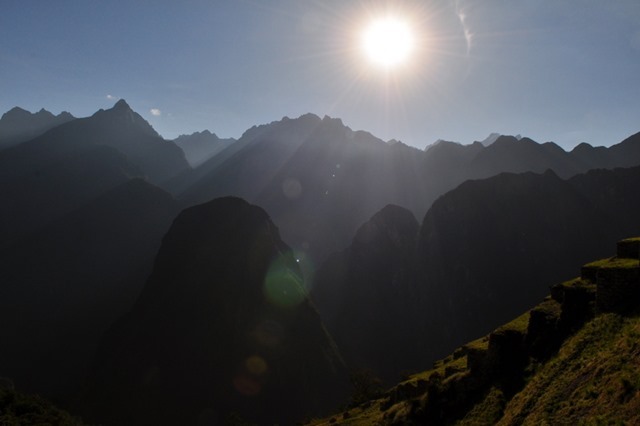 One faced sunrise during the December solstice and the other faced sunrise during the June solstice, creating rays of light that entered the temple on these sacred days. 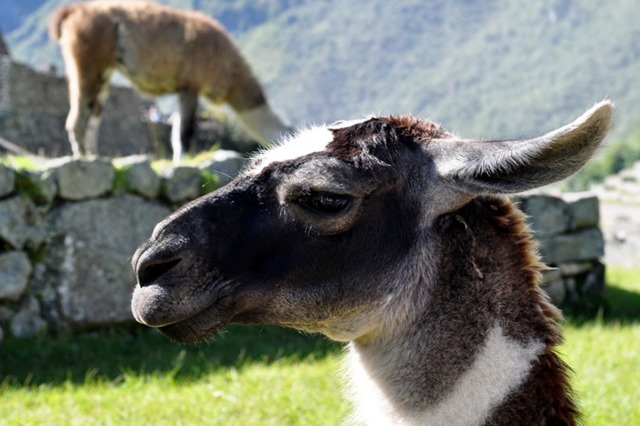 Though Victor told us that the llamas inside of Machu Picchu were there for tourists and not for accuracy purposes, my mom, sister and I still loved seeing them wandering around and made sure to snap a few pictures. They were fearless and came right up to tourists, though there was a rope holding them back from walking all over the ruins. 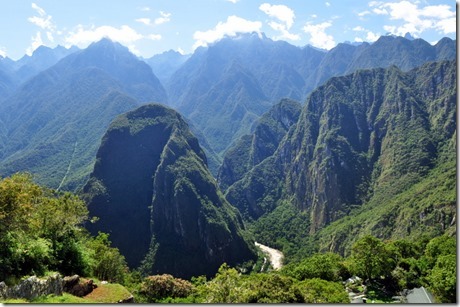 We set off on the Inti Punku (Sun Gate) trail which took us up to a site with incredible views of the mountains and Machu Picchu. It took us about 35 minutes to climb to the top. 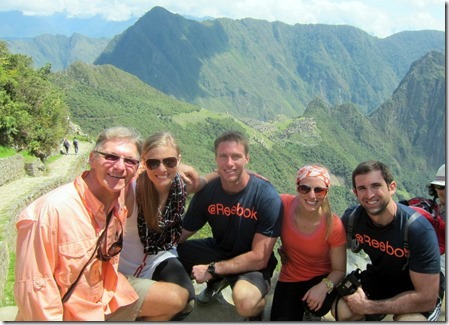 I was afraid it would be a really intense hike (the altitude really gets to ya!) 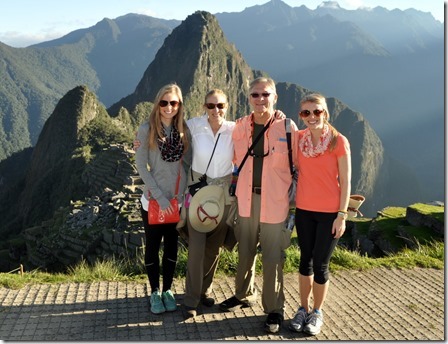 and, at times, all of the steps left me feeling quite breathless, but it was definitely manageable and we had a great time. Our hike on the Inti Punku trail was my favorite part of the day! As if the views from the top weren’t enough, the stone structure at the end of the top of the mountain provided a great resting place where other hikers stopped for lunch. It was gorgeous! 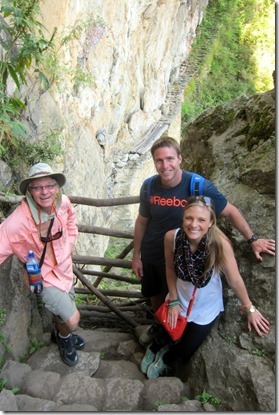 Following the Sun Gate trail hike, Ryan, my dad and I decided to do a second, shorter hike to the Inca drawbridge. The hike was easier than our first hike, but scarier! The trail looked right over the edge of the mountain and if I glanced over the side, I felt a bit dizzy. 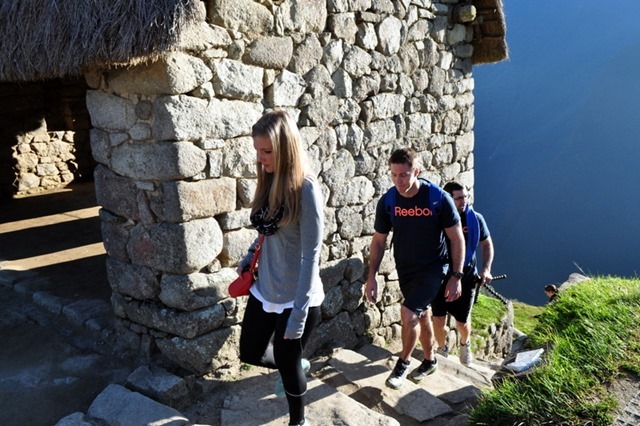 It’s definitely not the hike to do if you’re scared of heights! 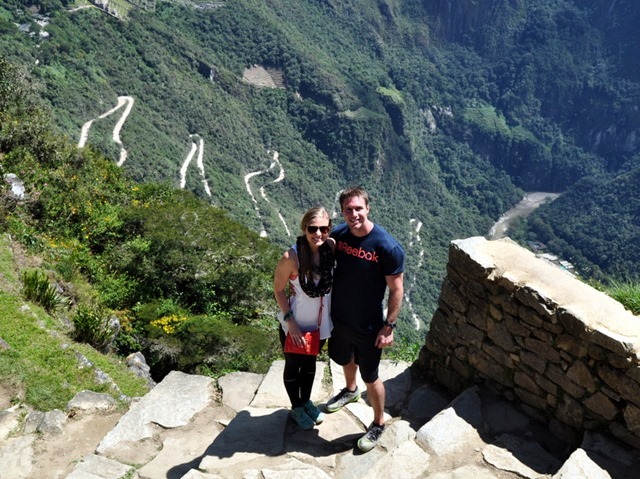 After our hike, we boarded the buses and headed back down the mountain and spent the rest of the day in Aguas Calientes before heading back to Cusco for the night. 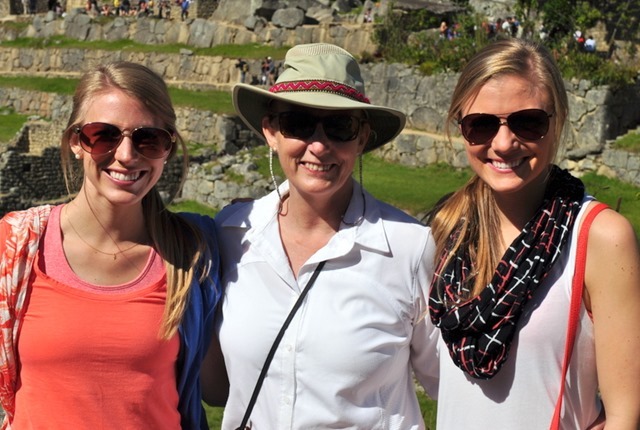 Our day at Machu Picchu was absolutely unforgettable. I will treasure the time we spent together at the ruins for the rest of my life. It was incredible! I teach history so I would love to go here! Great pix! I’m currently reading “The Sunflower” by James Patterson, and it talks about ALL the places you are visiting!! It’s awesome to put pictures with words! And it’s a good read too! Wow! Amazing views. Weather looks perfect, too. These pictures are so beautiful! I would LOVE to go on a trip like this. Back in college I took an ancient Greek art class and spent 7 days in Greece and it was by far one of the best things I’ve ever done. This post just made me giddy and excited because as I was reading your stories and looking at your photos I remembered exactly how I felt seeing amazing sights like this on my trip 5 years ago. Thanks for the reminder to do more traveling! I’m so jealous! Those pictures are beautiful! 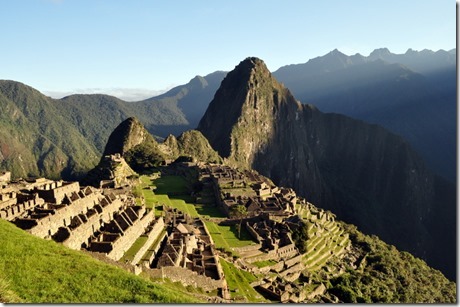 Going to Machu Picchu is on my bucket list- it’s so cool that you got to go! It looks amazing! I can only imagine seeing it in person!! I love your scarf! Can you tell me where you bought it? WOW. Definitely adding this to my dream vaca list! Looks like an incredible experience. We went last July and it is truly incredible. 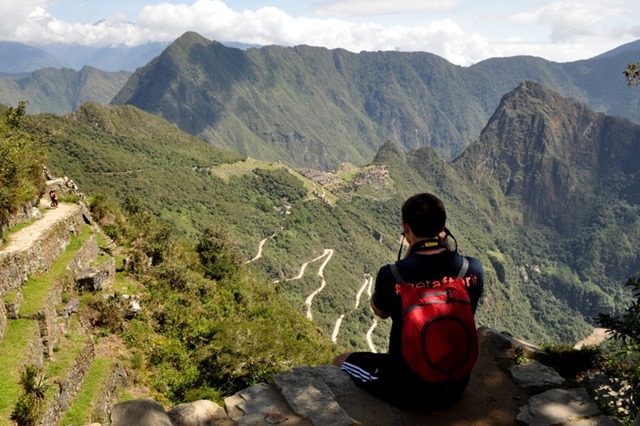 Reading about your trip has caused major adventure envy. I’ve been scrolling through all my Peru pictures for the past hour. I need to plan my next trip stat! Awesome pics! 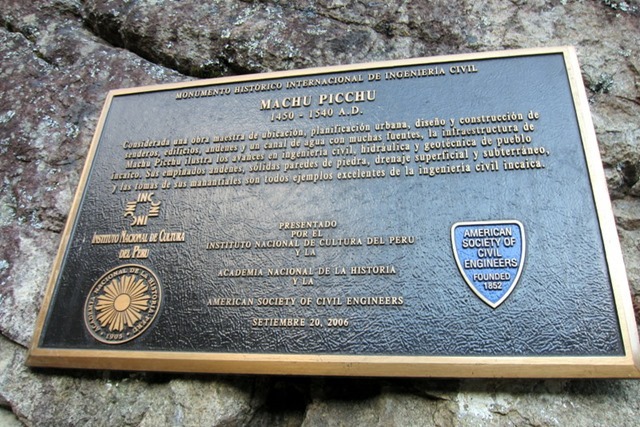 I went to Machu Picchu in 2005. 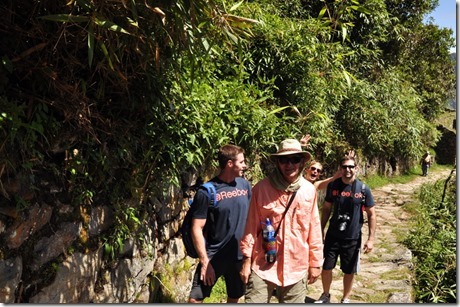 We did the 4 day, 26 mile trek across the Inca trail. One of the hardest and most rewarding things I’ve ever done. Hope you are having a great time and have a pisco sour if you haven’t already! Thanks girl—now my children 8,7 and three are now researching MP! I love you and your family! E from AR!! Hey! I love your pictures from Machu Picchu & what you did sounded great – i’m currently planning a trip there myself for this August – me & 3 other girls – and we are struggling to get it sorted & booked up. It’s so hard to know which trip to choose! 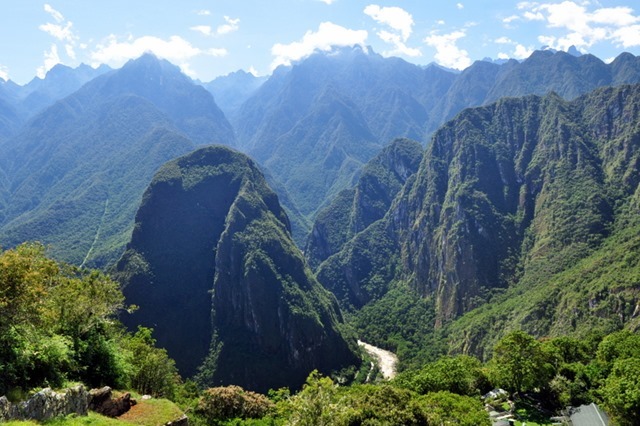 I was wondering if you could tell me who you booked with or just any tips for visiting Peru? It would be sSO helpful and so greatly appreciated! I love your blog! My husband and I toured Italy last week and all of your older Italy posts were filled with helpful hints. Thank you. Now, seeing your present posts, I’m ready for another vacation. You have a beautiful family and the sights look breathtaking. I can’t wait to see more. Safe travels! Reading this post just made me soo excited 🙂 I can’t wait to be there this winter! This is so incredible!! I would love to travel there someday! 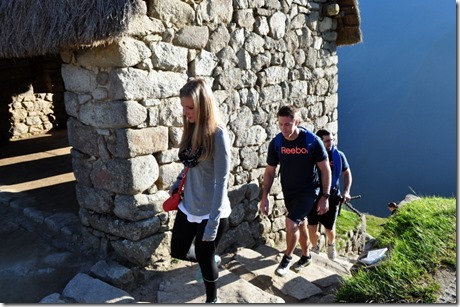 And the hike you did to the drawbridge looks like so much fun! It’s so frustrating when pictures don’t even come close to doing the real thing justice! 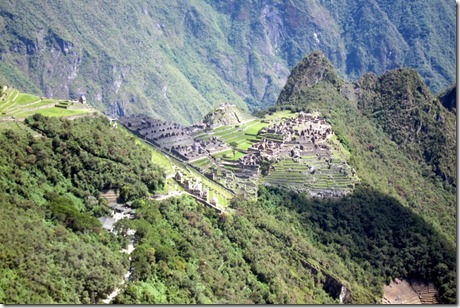 I saw Machu Picchu totally different from you and your pictures. 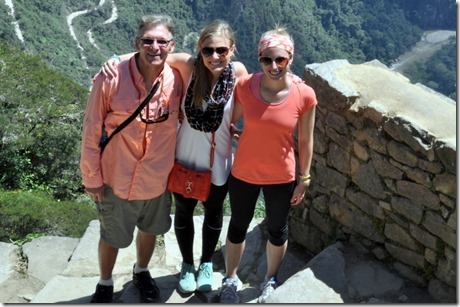 The day we arrived after the hiking the Inca Trail, it was 100% cloudy with 100% mist. It was extremely magical, with the ruins peaking out every now and then. That looks so beautiful! I like how Ryan and your sister’s boyfriend have matching shirts! Sounds like you are all having a wonderful family vacation! Hi Julie! Love your blog! 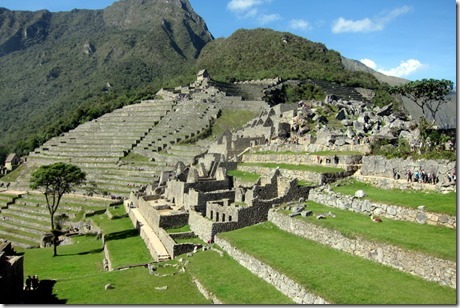 I’m in the final stages of planning my trip to Macchu Picchu w/ my boyfriend and wanted to get some advice. 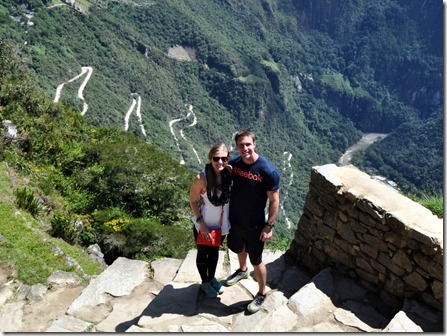 Which hotels did you stay in Cusco and Aguas Calientes? 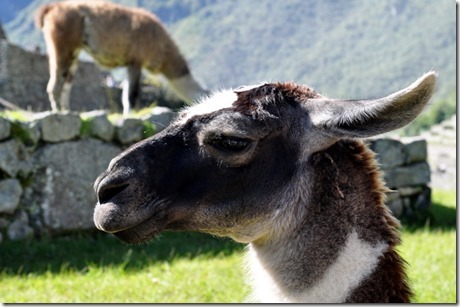 We are also staying in Ollantaytambo…can’t wait! Seeing your pictures makes me even more excited! This looks awesome, I have so many questions! Did you do a tour? Was there any camping involved? Were you active hiking/walking every day? 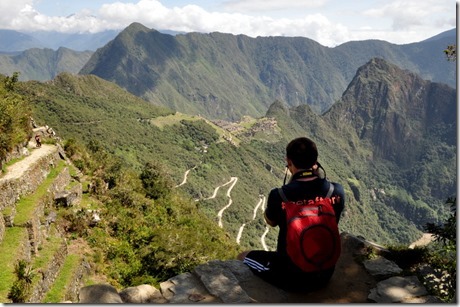 A lot of the tours I’ve seen for Macchu Picchu either have little leg work or too much camping. 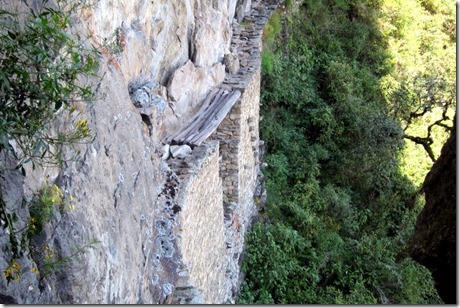 I like the multitude of hiking, but love the idea of running water and A/C at the end of the day. The ones that don’t have any hiking seem to drive you everywhere with the walking limited to your own exploring, rather than the typical hike to the top and enjoy the view type of hiking I enjoy. Looks AMAZING. I really want to go! Hi Julie! 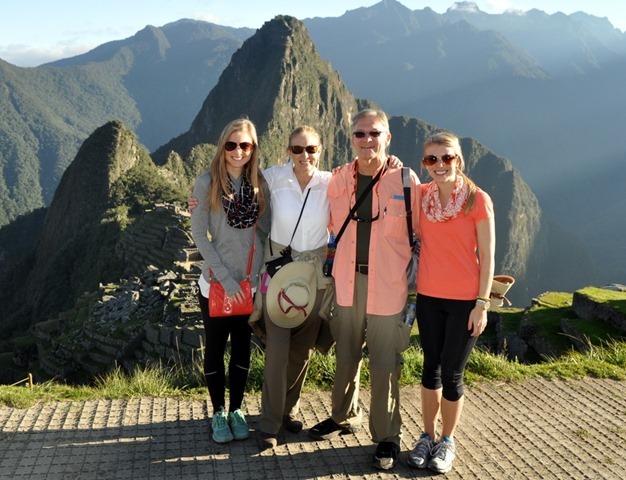 My family and I are planning to visit Machu Picchu over Labor Day of this year. Do you have any travel agents/ tour companies you recommend? Thanks! 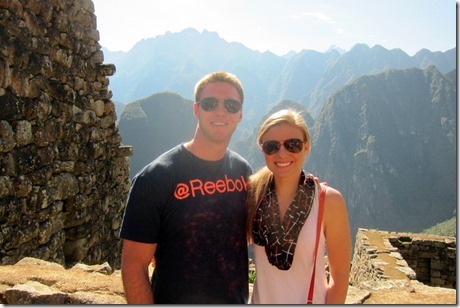 I’ve been reading your blog for a few years and love seeing all of your travel! My husband and I are planning a trip to Peru this fall and I was just wondering how you booked your Machu Picchu guide. Thanks so much! can you please tell me about your outfit in the first (and 7th) picture? it looks perfect for my upcoming trip! Hi! 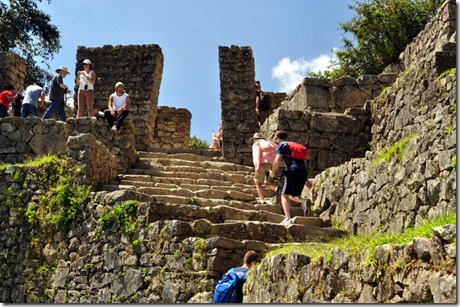 Did you use a specific tour company when you went to Peru? I’m looking into a December trip with my dad but he is 62 and I’m fearful that he can’t to do a long hike/camp. Thanks!